When it comes to makeup, your face is your canvas—something one aspiring makeup artist is truly taking to the next level. 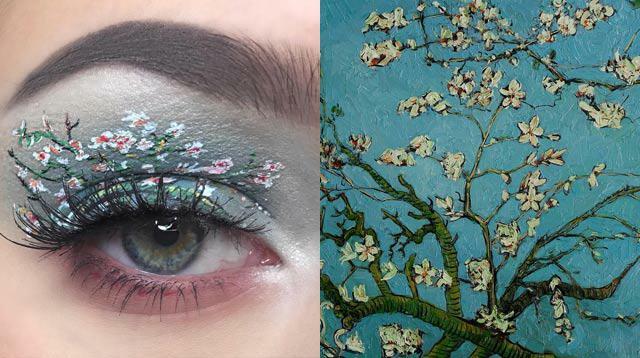 After experimenting with some animal-inspired eye shadow looks, 16-year-old Stefania Atupe recently tried her hand at something a little more intricate: recreating famous works of art on her eyelids. "When I posted [my] peacock design onto Twitter, a girl actually messaged me and said that it reminded her of a Van Gogh piece, and since I absolutely love Van Gogh I decided I would try out 'Starry Night,'" she told Mashable. "I then just sat down and spent a good hour and a half just recreating the look, slowly outlining it and developing the colors!" VINCENT VAN GOGH, "STARRY NIGHT"
VINCENT VAN GOGH, "ALMOND BLOSSOM"